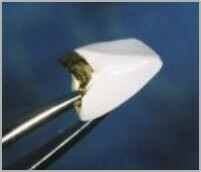 Porcelain Fused To Metal crowns and bridges have been used in dentistry for years. We are proud to offer a wide range of options in both porcelain and metal selection. Our accurate production process ensures great aesthetic and optimum functional occlusal surfaces on all our PFM cases.